The General Data Protection and Regulation (GDPR) is designed to give the control of personal data back to the people. It has the potential to reshape how organizations worldwide handle data privacy, with promises of heavy penalties for those who fail to comply. Depending upon the infraction, organizations could receive a maximum fine of up to four percent of annual worldwide turnover or 20 million euros (whichever is higher). DataSecurity Plus helps you strengthen your organization's security posture, prevent data leaks, and avoid compliance-related penalities by continuously monitoring and reporting on all activities on your file server. 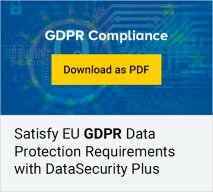 Meet the GDPR's stringent requirements using the various reports generated by DataSecurity Plus. Below is a list of reports you can use to prove that your organization is compliant with the GDPR.